This month, Mount St. Helens Institute hosted a Cybertracker Conservation Track and Sign Certficiation in the southern Washington Cascades. The Institute’s mission is to promote stewardship, science and appreciation of volcanic landscapes of Mount St. Helens and the Pacific Northwest. We spent two days examining the wide variety of wildlife tracks and signs found in the forests south of Mount St. Helens. While the mountain itself is a protected National Monument, outside of its boundaries the timber industry is very active in the southern Washington Cascades. Here huge clearcuts cover entire hillsides above the Swift Reservoir on the Lewis River. The swath of trees along the water’s edge is a mandated setback from fish bearing waters required by Washington State environmental regulations. Tracks of a cow elk (above) and her young calf (below) found on a forest road during the evaluation. The lush forests along the upper Lewis River are home to a large herd of elk and numerous other species of wildlife. 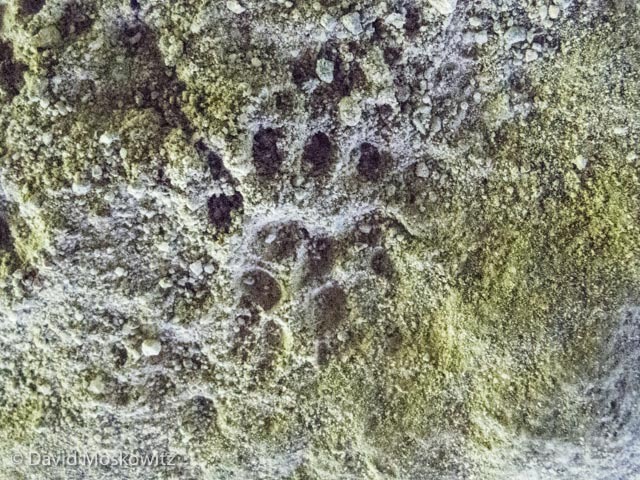 Left hind track of a bush-tailed woodrat (Neatomoa cinerea) in fine dust under a bridge along Pine Creek. Laura Belson inspects an elk antler rub on a red alder on the edge of a wetland. Justin Miller inspects the sign left behind by a woodpecker foraging on mountain pine bark beetles on a lodgepole pine. Congratuations to Maggie Starr, Tonja Spanish-Fish and Lloyd Murray who earned a Level 1 Certification and to Teri Lysak who earned a Level 3 Certification. For a complete list of certified trackers in North America click here. To learn more about Cybertracker Conservation and Track and Sign Certification click here or visit cybertracker.org.